A British citizen living overseas has been killed in Nepal following a 7.8-magnitude earthquake, in which the death toll is so far over 5,000. Families of those stranded have criticized the UK government’s slow response and failure to communicate. The Foreign Office confirmed a Briton is among the casualties in the earthquake which hit Nepal on Saturday.An avalanche triggered by the quake also killed 18 people on Mount Everest. At least 27 Britons are still listed as missing by the Red Cross. Many Britons and other foreigners are trapped in remote areas in Nepal where they were trekking. The family of a British man trapped in the Langtang Valley has criticized the Foreign Office for its slow response. Jonathan Blott, 24, from Lancashire, has been trapped together with his German girlfriend and a group of holidaymakers, as landslides cut off routes. His father, John Blott, gave their coordinates to the Foreign Office, begging them to help, but they told him they should make their way to the British embassy, Mr Blott told the Guardian. “The problem we have is that the Foreign Office aren’t telling us anything. I don’t know if they are doing anything and if they were doing something we assume they would be telling us about it,” Blott said, as cited by the Guardian. Susannah Ross, 20, from Bath, is also stranded with a group of 15 trekkers. 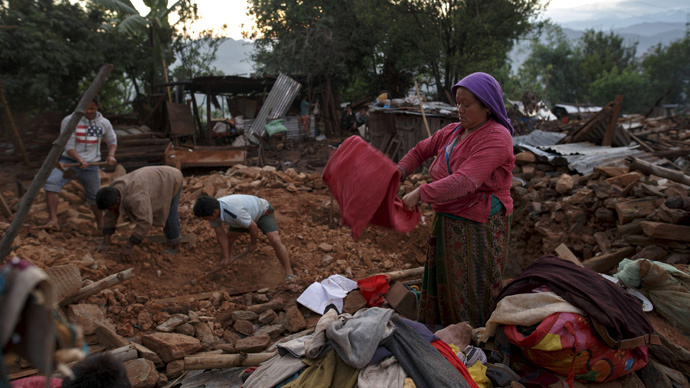 The British public has donated more than £19 million to the Disasters Emergency Committee (DEC) Earthquake Appeal. The UK government has committed £15 million in humanitarian aid so far. A team of Gurkhas left for Nepal on an RAF aircraft on Monday. They are equipped with solar lanterns and engineers to help with the international search and rescue effort. Britain is also reportedly preparing to send three Chinook helicopters to assist with airlifts of supplies on the mountainsides around Everest. The United Nations said eight million people are affected by the quake and 1.4 million people are in need of food.